Families are being encouraged through groups like HVM to think of auditory hallucinations, delusions, disorganized thinking, impaired functioning and other symptoms of severe mental illnesses as just part of the human condition, not medical problems. 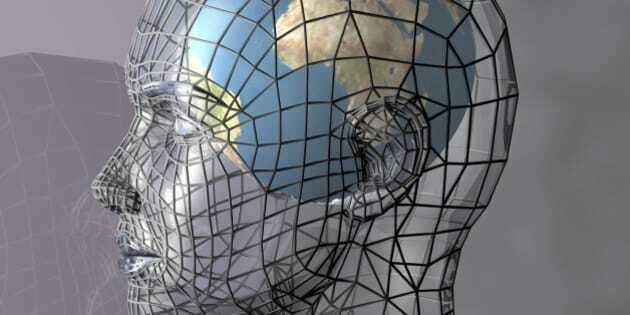 A globe within a transparent head, perhaps representing the potential of the mind, intellect or psyche. 3d abstract render. Recently the Hearing Voices Movement (HVM) has been receiving a lot of very positive press in Canada. The Globe and Mail, CBC's Tapestry program and the University of British Columbia's alumni magazine TREK have offered similar kinds of stories. The public finds out about the long known but not well-publicized fact that lots of people who have auditory hallucinations don't have mental illnesses. Then we learn about someone who benefitted from the supportive atmosphere that the Hearing Voices Movement's programs offers. We hear that this program helps people better manage their voices. How could anyone object to such a helpful use of our very limited mental health budgets? Some of us need to object because, by failing to differentiate between the needs of people who actually have psychotic disorders and those who don't, HVM poses serious risks. Recent coverage of HVM hasn't made clear that HVM doesn't distinguish between these two different populations. In fact, its founders believe that what psychiatry and the neuroscience community call brain disorders are just symptoms of emotional distress and what they call delusions are just unusual ideas. Dutch psychiatrist Dr. Marius Romme helped develop HVM in the 1980s. If you listen to this presentation by him or read this article, it's easy to believe that people who have been given psychiatric diagnoses like schizophrenia should reject the diagnosis and just work through their emotional problems. As well, Romme believes that "anti-psychotic medication prevents the emotional processing and therefore healing, of the meaning of the voices." These can be very dangerous messages for people who are struggling to understand and accept that they have serious brain disorders that will require careful management. Although the Hearing Voices Movement has been around for over 25 years, there is no research attesting to its benefits for people with mental illnesses. And operating from the belief that medications interfere with recovery can have negative consequences; ample research demonstrates that the longer the period of untreated psychosis is for people, the worse their outcomes are. At support groups for families of people with psychotic illnesses, I mainly see two kinds of families. Some of our family members received appropriate education and treatment and are no longer psychotic, even though they continue to struggle with other aspects of their illnesses. However, many of the people who attend have family members who resist treatment because they don't understand that they are ill. International research demonstrates that many people experiencing psychosis have anosognosia, a brain-based inability to understand that they are ill.
A growing problem in Vancouver is that family support groups are receiving presentations from proponents of HVM who don't make clear the movement's theoretical assumptions. The presentations don't reveal how deep the anti-psychiatry and anti-medication beliefs are of founder Marius Romme and other leaders of HVM. Romme maintains that there is no scientific reason for thinking of schizophrenia as a brain disease. He might be surprised if he visited Google Scholar, searched under "brain" and "schizophrenia" and looked at even the first few pages of the more than one million citations that could update him on advances in his field. Families are being encouraged through groups like HVM to think of auditory hallucinations, delusions, disorganized thinking, impaired functioning and other symptoms of severe mental illnesses as just part of the human condition, not medical problems. Meanwhile, they aren't being exposed to the larger context of these messages. An alarming de-medicalized approach to psychotic disorders is being promoted internationally through various groups. In the U.K. these trends are apparent in a very controversial monograph, "Understanding Psychosis and Schizophrenia," put out by the British Psychological Society. Its attempts to normalize psychosis have been vigorously criticized by numerous psychiatrists including Dr. Ronald Pies, Editor in Chief Emeritus of Psychiatric Times, who writes that the monograph, "Trivializes the very real suffering of those with psychosis." He also points out that the authors, by focusing on voice hearers, ignore severe problems that need attention, like the well-documented cognitive losses that can occur with schizophrenia. In looking at the research informing the British monograph's attempt to minimize the impact of psychosis, prominent psychologist Dr. James Coyne criticizes it for the poor standards of research it uses and its "self-serving anecdotal, rather than evidence-based accounts of psychosis." As well, he points out that the document seems to rely on anecdotes from people who hear voices but who don't use mental health services. In other words, the experiences of people who aren't being treated for mental illnesses are being used to suggest treatments for people who do have mental illnesses. The U.S. Substance Abuse and Mental Health Services Administration (SAMHSA) recently underwent two years of Congressional scrutiny ecause of concerns SAMHSA was promoting non-medical and non-evidence based approaches to severe mental illnesses. In June, Congress reintroduced the Helping Families in Mental Health Crisis Act which would ensure that mental health services use evidence based practices. Canada has psychiatrists who are actively working to educate the public about psychotic disorders from a science and evidence-based perspective. In a new video created by the B.C. Schizophrenia Society, Dr. Diane Fredrikson, head of Vancouver's Early Psychosis Intervention program, provides essential information about these illnesses. And, although Dr Romme maintains that psychiatry can't help people with schizophrenia, the film profiles Bryn Ditmars whose illness included both auditory and visual hallucinations; with psychiatric care he has rebuilt an active and meaningful life. This is the kind of information that families looking to provide the best help need to hear.